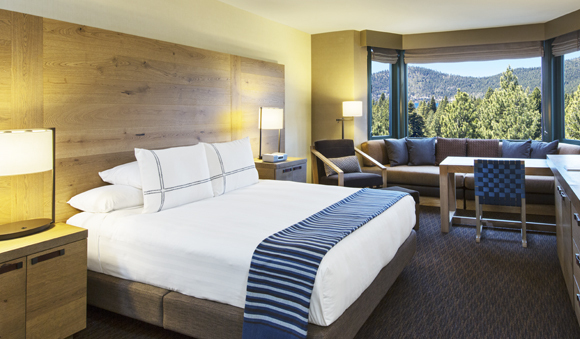 Featured Project: Hyatt Regency, Lake Tahoe | Nor-Cal Floor Design, Inc.
Lake Tahoe Hyatt in Incline Village NV, just underwent a 20 million dollar renovation. Matt Vannoy from Nor-Cal Floor Design worked directly with Barbara Turpin-Vickroy of the renowned design and architecture firm, CCS Architecture, on this project. In addition to working with Barbara on the custom finish for the hardwood flooring, Matt was hired to design headboards made of the same hardwood flooring material. The design took into account the size of the wood flooring planks available. The length and width determined the overall dimensions of the headboards so that no material waste occurred. The result is a stunning wood headboard that accentuates the contemporary, yet rustic feel of the rooms. In addition to the headboards, the hotel also utilized our wood flooring in the hallways as a border to the carpet, as well as the entries into the rooms, utilizing approximately 80,000 square feet of material. The material used for this project was a rustic oak with a custom finish.